The day finally came when Samsung unleashed a powerful mini to go along with its flagship smartphone. The Galaxy S5 mini isn’t just an under-powered lookalike of the Galaxy S5 but retains most of what makes the S5 one of the most desirable smartphones on the market, only in a more pocketable form factor. Samsung has gone with a bigger 4.5″ display (compared to the 5.1″ of the Galaxy S5 and the 4.3″ of the Galaxy S4 mini) but more importantly, it has still bundled the mini with a superb Super AMOLED panel. The fingerprint scanner and IR blaster are here as well and so is the water resistance – yay! There are some key differences between the bigger and smaller Galaxy S5 – for starters the bigger phone has a 5.1″ display of 1080p resolution, bigger camera sensor, snappier chipset that allows UHD video and a beefier battery. Still this year’s mini from Samsung is the closest yet from the company. Size aside, when you put it side by side with its bigger brother, the Samsung Galaxy S5 mini looks exactly the same. The hardware looks and feels the same and so does the software. We found the mini to be almost as fast as its sibling, too – check out our video take on the Galaxy S5 mini below. 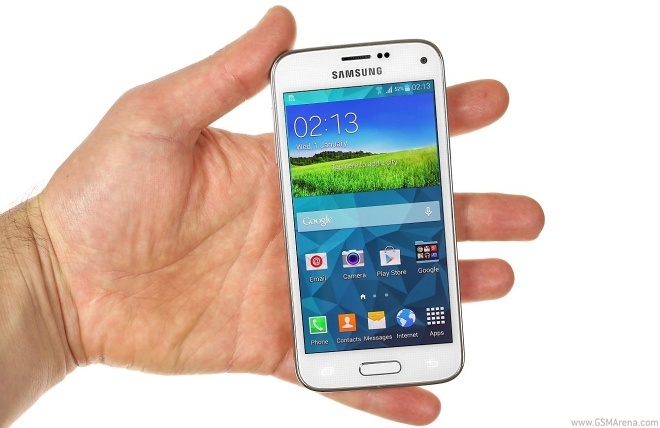 The Samsung Galaxy S5 mini matches the Galaxy S5 piece by piece in its build. The front has the same glass and raised edges around the screen. The button underneath the display is also fingerprint-ready with a similar dampened click to it. The back has the same exterior and feel to the touch. The plastic is matte, sturdy and opts for a dimpled-dot finish just like on the Galaxy S5. There’s also a heart-rate monitor under the camera lens but the former isn’t as elevated as the 16 MP one on the Galaxy S5. The camera on the mini is an 8 MP unit with less bells and whistles than the one on the Galaxy S5. Compared to the HTC One mini 2 the Galaxy S5 mini feels as a Galaxy S5 compared to the HTC One (M8) – that’s to say completely different. For starters the HTC One mini 2 has more heft to it, which isn’t bad, although both phones feel comfortably heavy in the hand. The Galaxy S5 mini is also thinner and shorter due to it not having the stereo speakers on the top and bottom of the screen. One thing we applaud Samsung for is the water-resistant microUSB port. Here you won’t need to pry the water-repelling flap the bigger Galaxy S5 has every time you need to access it. There a lot more to talk about with the Samsung Galaxy S5 mini and you can be sure we’re hands, elbows and torso deep into it so expect the review next week.